offensively and painfully familiar to each of us to the situation: the enemy rolls out -this shelter and without wasting time on data makes effective shot and then quickly get out of hand shelling. Doubly frustrating if it happens in the midst of battle when the outcome varies very much depends on the number of points is the strength of your machine. On why is this happening and how developers are going to make a difference, will be discussed in this article. * The illustration depicts a result of shelling targets after 3000 shots. As can be seen in the image, the maximum density of the fire is concentrated in the areas adjacent to the information center of the circle. Most likely has now hit the central sector. It is for this reason that at the moment there is always a chance to get a stray shell in the commander’s cupola or other vulnerable point of the enemy, which is simply a marker there navёl sight and made the shot, not even thinking of the Code. In the gaming community for such cases, the term “the guard” or “Rainbow” – score shot made at random, without any information. The regular repetition of situations when hitting the target is weakly dependent on the accuracy of the instruments and the degree of preparation of the shot, contrary to the logic of the game and requires correction. 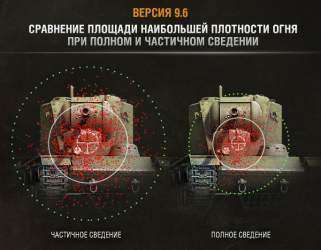 With the release of update 9.6 the number of shots was significantly reduced distribution of shells in a circle details will be finalized. 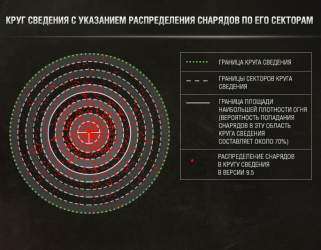 In order to get the probability of “the bull’s eye” when shooting without the information down, there will be the following changes: the probability of hitting the center of the circle of information is reduced from 16% to 10%, with as much increase the chances of getting into the zone adjacent to it. 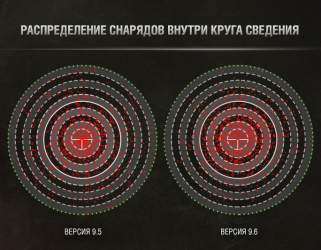 These changes make it possible to maintain the density of fire at the same level and at the same time increase the dependence of the result of the shot information sight. An illustrative example in the figure below. When complete information all right – the defeat of vulnerability is very likely. Be aware of these changes and shoot for sure: that no shot, the goal!